Holi is one of the major festivals in India. The festival of colours is a two-day celebration with people applying colours and water on each other on the second day. While this is a fun activity, the colours used in the festival are often hard and tough to get off. 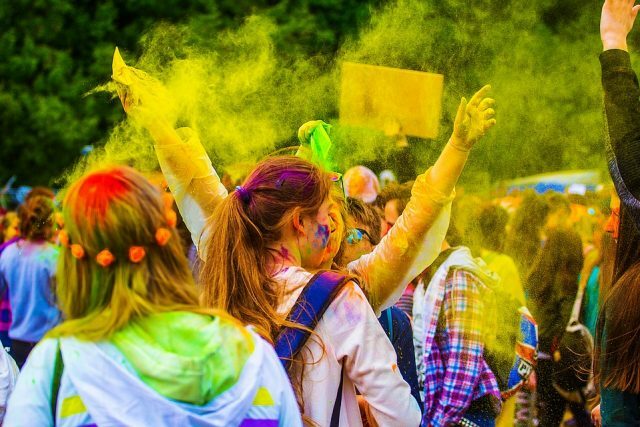 The chemicals used to prepare colours for the festival can cause severe skin and hair damage; which in many cases is irreversible. Organic colours are available in the market however, their higher prices do not appeal to many people. To remedy that, we recommend you to make your own colours in order to enjoy the festivities safely. Following are a few ways to make your own colour this Holi. Red Sandalwood powder is not only beautiful colour but is also amazing for skincare. Using this in powder or wet form will not only be very beneficial but also be fragrant and fun. Another option to make red colour is to grind red hibiscus flowers and mix it with flour. The flour will increase the quantity of colour and will also stick to the skin for longer. Wet orange colour can be easily made by mixing good quality henna or saffron with water. Turmeric is an easy and readily available yellow colour in the kitchen. The spice may be harsh on the eye. To make it mild, mixing marigold flowers, orange peel powder, some essential oils along with the turmeric can do the needful. Wet blue shade can be achieved by crushing the berries and mixing it with water. Dry blue can be made by grinding blue hibiscus or Jacaranda flowers. Mixing henna powder with flour can make a beautiful green shade for dry colour. For making a wet green, boil neem leaves with water. Beetroot is a natural pink. Boiling it with water is a beautiful pink colour for Holi. Grinding beetroot and drying the paste later can make a pretty pink shade. It can be later mixed with flour to increase the quantity of dry colour. Chemical colours have caused an aversion against the festival for many. This festive season, we ask you to ditch those harmful colours and adapt to the eco-friendly organic colours. Wish you a very Happy Holi.